3 1/4 " slingback fabulous "new" heels.black patent leather & suede.such a classic shoe that can be worn with everything.size 7 1/2. Attractive Open Toe Stiletto. Breathable Leather Upper for Superior Comfort. Reduced From 79.00. Padded insole. Slingback strap with a buckle closure. ANNE KLEIN. Satin Bow detail at vamp. Patent Leather Heels ELISHA. Heel is about 4". Platform is about 1/2". Classy, comfortable and just the right amount of details! Black leather uppers, iflex sole, 3" block heel in patent leather. New, Anne Klein Heels size 6 M.
Light scuffing and small dents on back heels. Lint/dust along sides and back heels of shoes. Length (Heel To Toe): 11.5". Bottom soles are slightly dusty, no wear to treads. Left bottom soles are not evenly flat. Classic AK Anne Klein gorgeous open-toe wedges. Perfect for work or a evening out. Very Nice used condition . Versatile, Comfy and quite slenderizing while giving you added height . No marks, dents or tears. Soles normal wear . Manufacture: Anne Klein. Each manufacture's sizing varies. I strive to do the best I can. We have grown from that beginning. Size: 9 narrow. Closure: slip on. Fabric: leather. Color: black and gold. Material Fabric. Color Brown. Good used condition. Anne Klein peep toe pumps heels - comfortable and fashionable with black ribbon detail on the toe. Size 10. Shipped with USPS Priority Mail. Thanks! Black slip on heels with an open toe. Perfect for any special occasion, dance or even a career heel. Made with a fabric upper and leather sole. BY: AK ANNE KLEIN iflex. SZ: 7 1/2M. Pre-owned in beautiful condition! Lovely style! New in box. Style “Elane”. Color “White/gold”. Man Made upper and lining. Contrasting trim. Adjustable ankle strap with a buckle closure. Man-made lining. Lightly padded insole. Condition: EUC, Very minor wear on bottom sole (see photo). Very pretty flower design on center. Also, don't forget to consider the stretchability factor in the fabric content. Needless to say, that my prospective on life and "things" shifted drastically. Good used condition, blush pink. Some marks to the heels and upper as shown but lots of life left! MATERIAL: Satin upper, leather lining / leather sole. HEEL: 3.25 in. MADE IN: Italy. Preowned Shoes In Excellent Used Condition, Minor Signs of Previous Worn. Before buy it, look all actuals photos for details; Pic # 12 shows the Insole of both shoes with dents/scuffs from storage. See photos excellent condition very light sign of wear. Color Silver. Women's Anne Klein Slingback Heels/Pumps. AK Logo Fabric. Tan and Brown Colors. Size 9 Medium. Horsebit Clasp On Arch. Pointed Toe. 3.5" Heel. Elastic Strap Behind Heel for Closure. Made of Leather. Size 6.5 U.K. Size 40 Europe Shipping: There are Two Options for Shipping. The First Option is Parcel Select Ground. It will save you $3-$4 in Shipping but Will take Longer to Arrive at Your Destination. The Second Option is Priority Mail Which costs $3-$4 more for Shipping but will arrive Several days earlier. Click on the option that better fits your needs. They are gently used and in very good condition. They are a BEIGE & WHITE in color. They are all man made materials. They have elastic stretch for easy slip-on and off. ANNE KLEIN. ~~~IN EXCELLENT PRE-OWNED CONDITION~~~. Leather upper. Heel is about 3.25" high. A few light marks to toe, side and rear as shown. On the bottom:AK, ANNE KLEIN, Size 6M. 3 1/2" (8.89 cm) Heel. Closed square toe. 10" (25.4 cm) Long. On the sides of both shoes are open. Color: Gold. On the top on the front is a strap with a shiny silver-tone buckle with (9) clear faceted baguette rhinestones on the top of each shoe (no missing stones). Pointy Toe Slingback Heels. 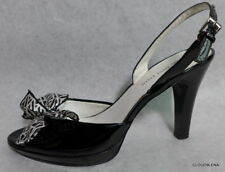 ANNE KLEIN Black Patent Leather - 8 N. Size: 8 N (Narrow). Note: Apparent color differences are due to light & shadow in photo. Heel: Approx 3". Slingback with buckle closure. Pointed toe. These heels are in excellent used condition - a lot of life left in them! They have a leather upper and man made sole. When the occasion calls for a classy look, you will be glad to have these heels in your closet. Originally $375.00 Made in Italy I wore these shoes only to try on in the house with dresses. As you can see in the pictures they are new. They are black satin with a delicate jewel encrusted button on the side. The soles are leather. They will make you feel really feminine and the pointy toe will elongated your beautiful legs. One pit in the sole of one, see pics, otherwise look and feel new. AUTHENTIC " ANN KLEIN DESIGNER COLLECTION SERIES" WOMAN'S BLACK SATIN SLINGBACK HEELS W/MULTI-COLOR STONES & GENUINE LEATHER SOLES! THESE SHOES WERE SOLD IN NORTROMS! THE PRICE PAID FOR THESE SHOES WERE WELL WORTH IT FOR A GALLA I WAS TO ATTEND. The Anne Klein AK Virtruos Sandals feature a Synthetic upper with a Open Toe. The Man-Made outsole lends lasting traction and wear. Color: Dk Bronze. Rev up your look with these delightfully delicious heels from AK Anne Klein. Constructed with iflex technology for great comfort. AK ANNE KLEIN. NOTE: There is a very minor spot on one of the jewels where the finish is coming off.